Amazon deals: Save 25% on Echo and Fire accessories | What Hi-Fi? Having a ball with the Amazon Echo smart speaker, Fire tablet or Fire streamer you got for Christmas but in need of some accessories? Perhaps you fancy a tablet case, an Alexa remote, or an adjustable stand for your Echo Spot? Well, now's as good a time to browse as any. Until the end of the month (January 31st, 11:59pm), Amazon is offering 25% off 130-odd accessories for its Fire, Echo and Kindle devices. 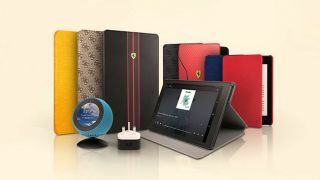 The included accessories include cables, Kindle and Fire tablet cases and stands, USB charger adapters, a battery to make your Echo speaker portable, plus lots more. At the checkout, you simply need to the code NEWYEAR25 into the field 'Gift Cards + Promotional Codes'. Not got an Amazon device but after one? These are the best Amazon UK deals available right now.